Jennifer The older universities in Sweden have some interesting centuries-old customs; one of them peculiar to Uppsala, the firing of the cannons at commencement, I have already covered. Another is that the defense of a doctoral dissertation (or disputation), if it is successful, is celebrated with a Disputationsfest. Yesterday, one of the students (let's call him F.) in my department successfully defended his dissertation. The defense itself lasted from 10am to about 1:30pm. Immediately after F.'s success was announced, everyone in the department dived into the sweet champagne and bowls of cheezy-poofs that had been set out in the common area earlier. This was not the Disputationsfest itself, of course; that was later in the evening. I had not been formally invited to the Disputationsfest, because RSVPs were required before I even got here, but everyone said I should come anyway, and not to worry, because F. was a generally informal guy, so surely his party would be informal too. I did some work in the afternoon, but everyone except another postdoc (E.) left early to go home and change clothes. I had come to work looking decent from the waist up, and was assured by E. that jeans would be okay (he was wearing them too) as, again, F. was an informal guy. "I brought a coat, but probably won't put it on," he assured me. Sometime later, E. and I headed to the hall reserved for the party (accidently about a half-hour early, as it turned out, and him in his coat after all, the fink). As people started drifting in, it became apparent that this was in fact a very formal event. 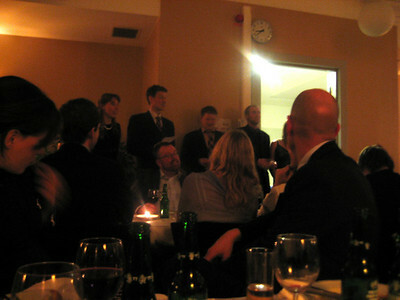 Men in suits (some three piece), women in fancy dresses. F. was very popular and had many friends and family attending, and out came the assigned seating chart. Fortunately there had been some last-minute cancellations, and my name had been pencilled in over someone else's. At each place was a bottled beer and beer-glass, a wineglass, a small shot glass for aquavit, and a double-sided page of text. The napkins were cloth, and there were tea-lights on the table at every other place or so. The beer was apparently there to hold us over until the wine could be passed around, and then gentlemen bearing aquavit came by to fill the shot glasses. Dinner turned out to be buffet-style—T., the very nice airline pilot I was seated next to (whose girlfriend's place I was sitting in) offered to carry for me, which was appreciated. Not too unusual buffet fare—ham slices, beef slices, salmon, rolls, cheese and fruit skewers, puff pastries, potatoes au gratin, all of high quality and quite delicious. We were given about 15 minutes to eat, and then the party started. About every ten minutes thereafter, someone stood up to say something in praise of or tease about F., some in English, most in Swedish. At other random times, a guy stood up and held up the paper, which turned out to be song lyrics, and we all sang one of the dozen or so traditional Swedish drinking songs whose lyrics were on the paper. Twice, two small groups stood up to sing a song directly to F.; a video had been produced by the department artist featuring interviews with other students, lightly roasting F.; at one point, two other students made F. attempt to explain some aspect of his dissertation in charades; F. was presented gifts of varying usefulness or silliness. I lost track of the interruptions after about the first eight or so; I think there were at least twenty before I left. 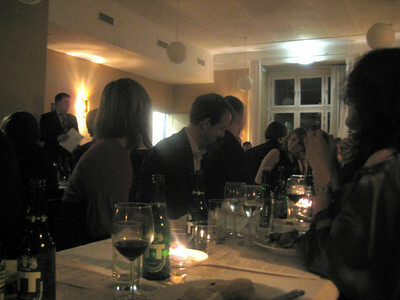 Each interruption, be it speech, song, or story, was followed with either a toast with wine or a skål with aquavit, mostly the latter. Aquavit glasses, once emptied, were immediately refilled. Long story short, a Disputationsfest is lots of fun but can be a one-way ticket to extreme drunkenness if one is not wary. I was as wary as I could be while still being polite, as it had been a long day and I had to catch a bus home. Since I had been assured that F.'s Disputationsfest would be "informal," I had emailed Joe that I would probably be back to the hotel around 7pm. I actually got home slightly after midnight. When I left, the party was still going full swing, if not actually ramping up. The only negative thing I can say about a Disputationsfest is hardly a complaint, but just an observation that all the interruptions make it difficult to keep up a sustained conversation with one's neighbors. I never did get to hear the end of T.'s story of landing at a small airport up north earlier in the day, made in a blizzard with severe crosswinds, nor did I get to hear as much as I would have liked of K.'s (the graduate student seated opposite me) stories about the tribulations of gathering flatworms in Russia. So, where do you get softener salt?